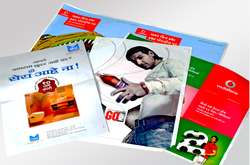 Leading Service Provider of posters printing from Ahmedabad. Advertisement Posters that are made by us are widely appreciated by our clients for their varied features. These are available in different sizes, shapes, colors and models as per the specifications of the customers. These posters are made by hand or machines. We also make this with adhesive gumming on one side of a poster to help it stick properly to any surface.